Dip-netting to test water quality. Mary Caflisch, a Water Resources Extension Agent with Clemson University Research Foundation, joined our quarterly meeting in May 2014 to teach us how to test for water quality. She brought some pond water from Clemson Sandhills which we worked with inside. 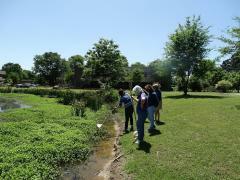 Then we moved outside to the pond at Heathwood Hall to observe macroinvertebrate diversity, using a dip net. Macroinvertebrates are a second-tier trophic level in the water column. They are often primary consumers that feed on algae and plants (producers).